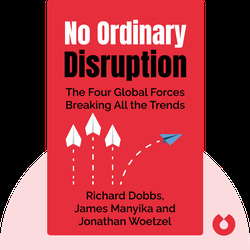 No Ordinary Disruption (2015) details four forces that are changing the world’s markets in profound ways. These blinks show you how the business world, the jobs that support it and the market that shapes it are transforming and what companies, governments and individuals need to do to not only survive but succeed in this new world order. 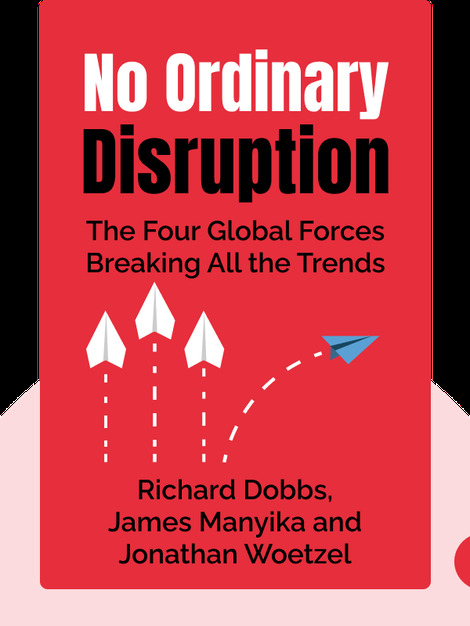 Richard Dobbs researches global economic patterns at McKinsey. He has taught at the University of Oxford and at several other universities; No Ordinary Disruption is his second bestselling book. The director of the McKinsey Global Institute, James Manyika has advised a number of leading technology companies in Silicon Valley. He is also the vice chairman of the President’s Global Development Council, appointed by US President Barack Obama. Jonathan Woetzel cofounded McKinsey’s operations in China, where he lives. He is a lecturer at the Guanghua School of Management at Peking University, and has written four books on China.